Personalize your space with this Volleyball Players Small Wall Decals Set. 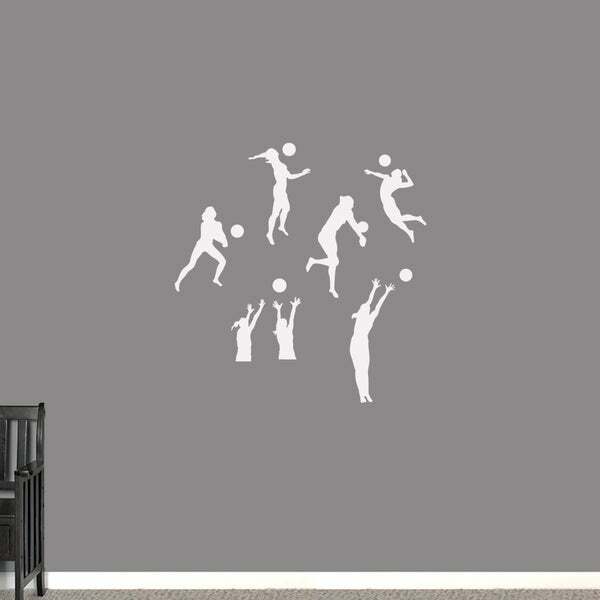 This volleyball decal set is packed with awesome volleyball players. This decal set is perfect for a girl's bedroom, or even a school locker room. These wall decals measure tip to tip and can be applied to any smooth surface. In 2007, Sweetums Signatures was born. Made and produced right here in Ohio, we are a small business tailoring to the decor and service needs of our customers. From indoor wall decals to outdoor signage, we are built on core values of hard work, family and delivering on our promises to our customers. We believe that every home deserves a designer look without a designer price tag. This custom-made item will ship within 1-10 business days. You don't need to take a day off to make your walls look great. If you plan ahead, you can make any wall in your home look exactly how you want in an hour or less. Keep reading for handy tips and ideas for quickly dressing up your walls. Whether it’s in an entryway, bedroom, or living room, a gallery wall makes a visual statement. Follow these easy steps to make your own gallery wall and start showing off your favorite photographs, art, and decor. Discover how art and wall decor can add interest and personality to your space. With endless options and styles to choose from, these ideas and tips will help you design a wall space that makes you feel at home. Get the most popular Christmas gifts for the home. You can wrap up the best home decor presents of 2016 when you shop these gift ideas. Shop our huge selection of home decor at Overstock.com.